Our Boutique Style hair bows for infants, toddlers and girls are as traditional as our Classic Collection of hair accessories with a little more perk! The perky loops of ribbon sit beautifully on top of your princess. 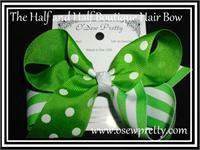 Also available in our personalized hair bow collection. 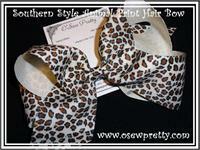 Designer bows for her hair that are available in large, medium or small to fit any child. If "BLING" is her thing then top off her special occasion outfit with this sparkly crystal accented hair bow. Center available in Pink or Multi Clear . 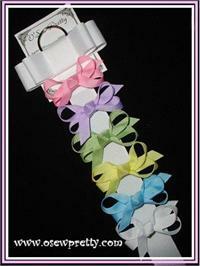 Shown in all white but available in your choice of streamer, knot and hair bow color. Add a removable change a bow button to personalize your streamer. You Choose just the right size hair bow. Available in 90 solid Grosgrain colors. Delicately Structured in exquisite double faced Satin. What's super cute and colorful? This Awesome hair bow! Classic sophistication with a added Safari Fun! 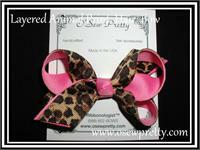 Available in many animal prints and 5 Hair Bow Sizes. Shown in Medium Forest polka dot with matching curls. 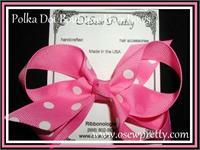 Curls will match hair bow color and dot color as shown, but you can add up to two additional colors. 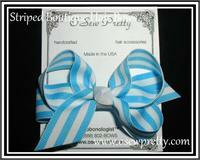 A perfect back to school hair bow made from designer stripe ribbon. 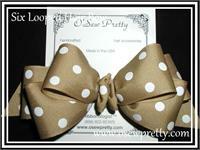 Loopy Hair Bows Made from Polka Dot Ribbon. 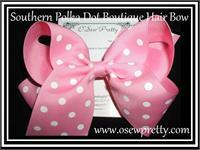 Our perky boutique style bow is perfect anytime and available in 6 sizes and in any of our Polka dot ribbon colors. 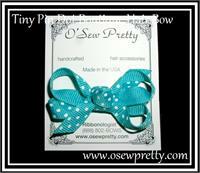 Our smallest hair bow in the O' Sew Pretty collection. 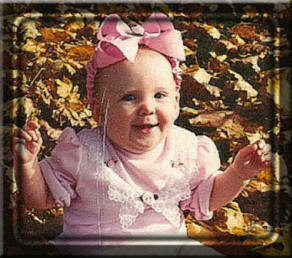 This bow is placed on our original velvet covered clippie to stay put even on the finest hair . Our smallest version of boutique hair bows. 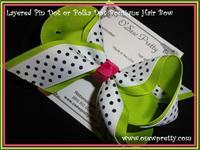 This perkey little bow is available in so many colors. 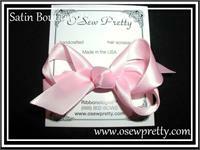 Our smallest version of the boutique hair bow. 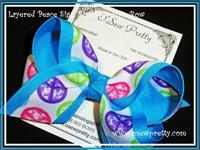 This perkey little bow is available in so many colors. 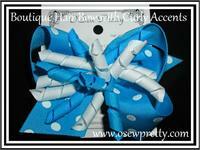 Our smallest version of the boutique style bow. 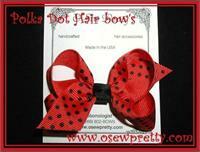 This perkey little bow is available in so many colors. The clip has been lined with velvet ribbon to prevent slipping. 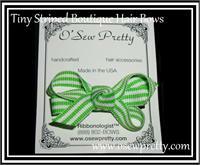 This boutique style hair bow is perfect anytime and available in any of our striped grosgrain colors. 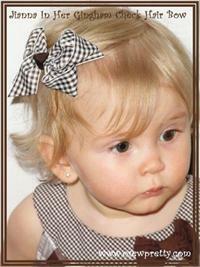 Our boutique style hair bow is perfect anytime and available in all of our plaid ribbon colors. 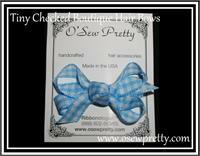 Our boutique style hair bows Made from Pin dot Ribbon. Classic sophistication with a added Southern charm ! 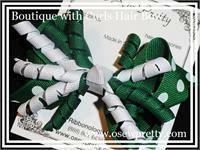 Only 2.25'' across and just the right size to clip onto two little pigtails, or hold back hair to the side. 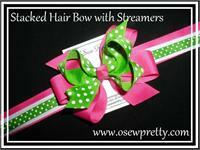 Looking for a hair bow that commands attention? This hair bow is fashionably sassy, with todays most popular tulle accents. 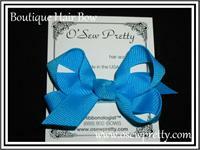 This has all the full loops of our Boutique hair bow with a slightly different look. Shown in Large with Apple polks dot and apple stripe. 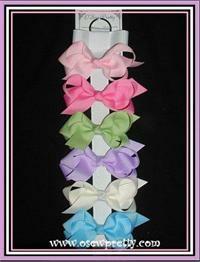 Create your own design by choosing your bows color and then 1, 2 or even 6 different curly colors. Shown In large turquoise polka dot. 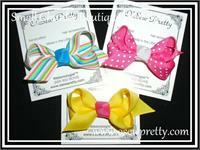 Create your own design by choosing your bows color and then 1, 2 or even 6 different curly colors.